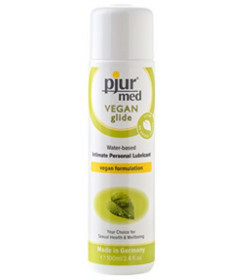 Pjur Med Vegan Glide is a specially developed, preservative-free water-based intimate personal lubricant with solely vegan ingredients and without any animal testing. It provides gentle additional moisture for a long-lasting lubrication and is pH-balanced. The formula is especially suitable for sensitive mucous membranes. Free from perfume, parabens and glycerine.